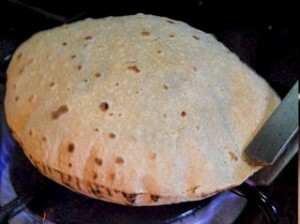 Chappati recipe by Sanjeev at DesiRecipes.com. Put flour in a large bowl with half the water. Blend the two together until it holds. Beat and knead well until it forms a compact ball. Knead dough into it is smooth and elastic and set aside for 30 minutes. Knead and divide dough into 4 to 6 parts. Roll each ball into a tortilla like flat, about 1/8 inch thick. Heat an ungreased skillet and lay the rolled out dough on it and let cook for about 1 minute. Turn and cook the second side for 2-3 min or until small bubbles form. Turn again and cook the first side pressed lightly with a towel until it puffs. Serve warm (maybe slightly buttered). I appreciate this sort of bread, it seems to me simple and good for any bigginer. Thanks for sharing your aknowledga.